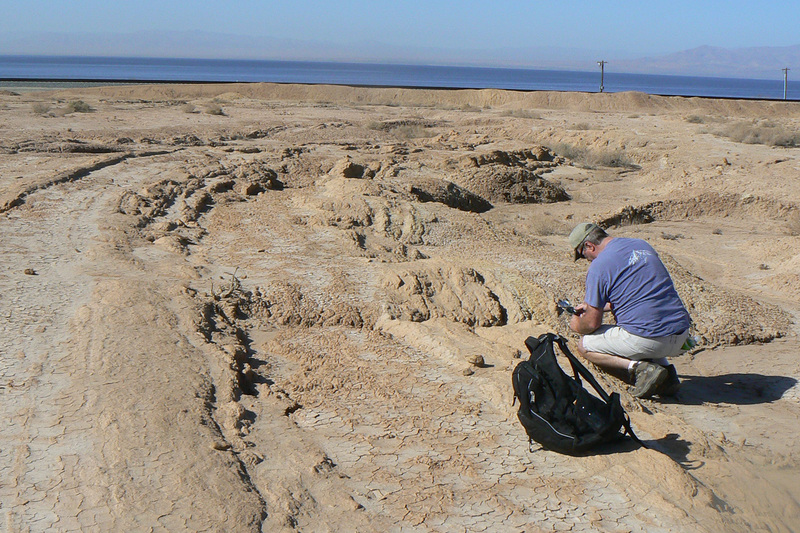 Scripps geologist Neal Driscoll taking measurements of the onshore sediment layers along the eastern edge of the Salton Sea. A swarm of nearly 200 small earthquakes that shook Southern California residents in the Salton Sea area last week raised concerns they might trigger a larger earthquake on the southern San Andreas Fault. At the same time, scientists from Scripps Institution of Oceanography at the University of California San Diego and the Nevada Seismological Laboratory at the University of Nevada, Reno published their recent discovery of a potentially significant fault that lies along the eastern edge of the Salton Sea. The presence of the newly mapped Salton Trough Fault, which runs parallel to the San Andreas Fault, could impact current seismic hazard models in the earthquake-prone region that includes the greater Los Angeles area. Mapping of earthquake faults provides important information for earthquake rupture and ground-shaking models, which helps protect lives and reduce property loss from these natural hazards. The National Science Foundation (NSF)-funded study appears in the Oct. 2016 issue of the journal Bulletin of the Seismological Society of America. “To aid in accurately assessing seismic hazard and reducing risk in a tectonically active region, it is crucial to correctly identify and locate faults before earthquakes happen,” said Valerie Sahakian, a Scripps alumna, and lead author of the study. The research team used a suite of instruments, including multi-channel seismic data, ocean-bottom seismometers, and light detection and ranging, or lidar, to precisely map the deformation within the various sediment layers in and around the sea’s bottom. They imaged the newly identified strike-slip fault within the Salton Sea, just west of the San Andreas Fault. Recent studies have revealed that the region has experienced magnitude-7 earthquakes roughly every 175 to 200 years for the last thousand years. A major rupture on the southern portion of the San Andreas Fault has not occurred in the last 300 years. The findings provide much-needed information on the intricate structure of earthquake faults beneath the sea and what role it may play in the earthquake cycle along the southern end of the San Andreas Fault. Further research will help provide information into how the newly identified fault interacts with the Southern San Andreas Fault, which may offer new insights into the more than 300-year period since the most recent earthquake. Scripps researcher Alistair Harding and Nevada Seismological Laboratory seismologist and outreach specialist Annie Kell also contributed to the study.